There’s nothing like learning about trees from someone who has discovered for themselves what makes a winner and how to grow it. Recently I had the opportunity to tour a small wholesale nursery near Corralitos. Jon Craig has evolved from Silicon engineer to a propagator of plants and trees and he’s all the happier for it. He laughs when he says he has loved plants for a very long time starting with his first job mowing lawns. As a former engineer it’s all about the research and the plants he grows showcase his success. His very favorite tree is the dogwood. 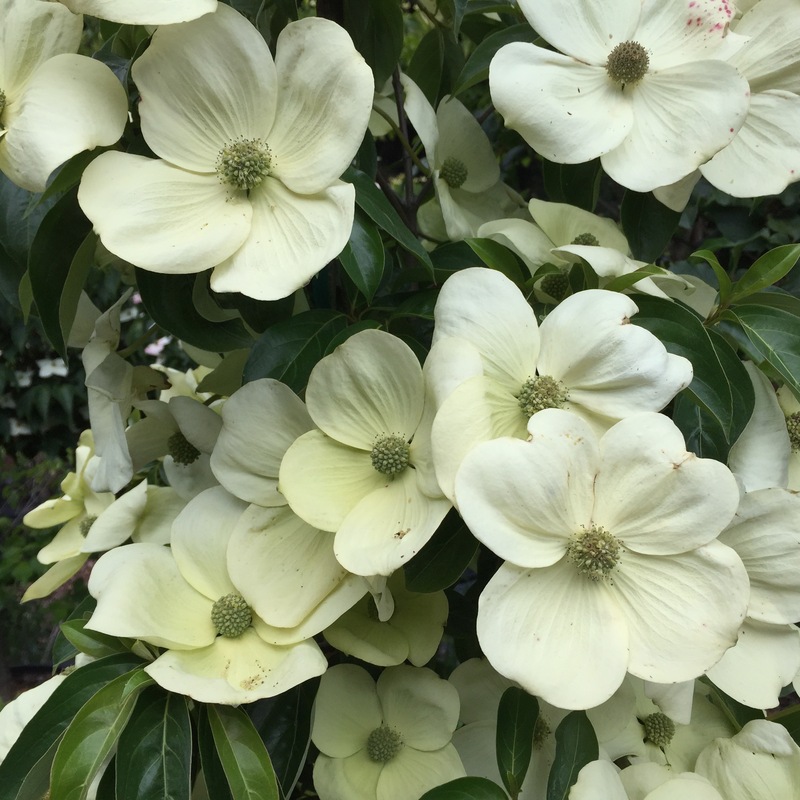 Not just any dogwood but the ones that bloom with the largest flowers for the longest time. There are four main species of dogwood trees. From the Himalayas in China comes cornus capitata, Korea is home to cornus kousa. Cornus florida grows on the east coast and the west coast is home to cornus nuttallii or Western dogwood. We are all familiar with the Eastern dogwood that blooms early in the spring. It’s beautiful but rain and wind can cut short the flowering season many a year and the root system is prone to disease. Our Western dogwood is prone to leaf spot fungal diseases. The Kousa dogwood is a more drought tolerant, disease resistant and a tougher plant all around. 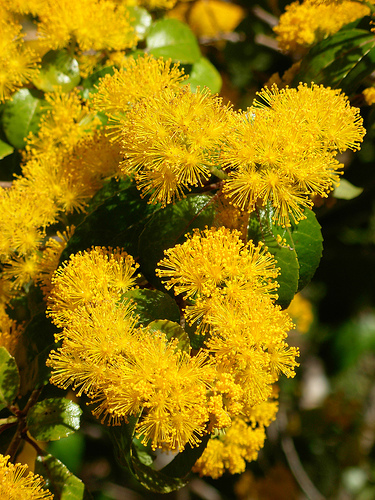 Large, showy flowers open after the tree has leafed out and remain for a long time. This makes it good for hybridizing with other varieties. Deciduous dogwoods don’t like wet feet especially in the winter. That’s how they develop fungal disease. But there’s an evergreen dogwood that can handle moisture all year round. That tree is Jon Craig’s very favorite. With a name like Mountain Moon you can just picture it blooming high in the Himalayas. Huge flowers up to 6” wide can last from late spring into early summer. After flowering, the fruits begin to form and grow into red balls about the size of large strawberries. This is the reason is it also known as the Himalayan Strawberry Tree. They are edible but bland and tasteless to us. The birds love then though and they remain on the tree while woodpeckers and robins have a feast. Cornus capitata ‘Mountain Moon’ is a tough tree that can handle strong winds and isn’t bothered by any pests or diseases. They enjoy lots of organic matter as do all dogwoods. Many people think of dogwoods as an understory tree but this location is often too shady. Grow them in a full or partial sun location that gets afternoon shade after 4pm. 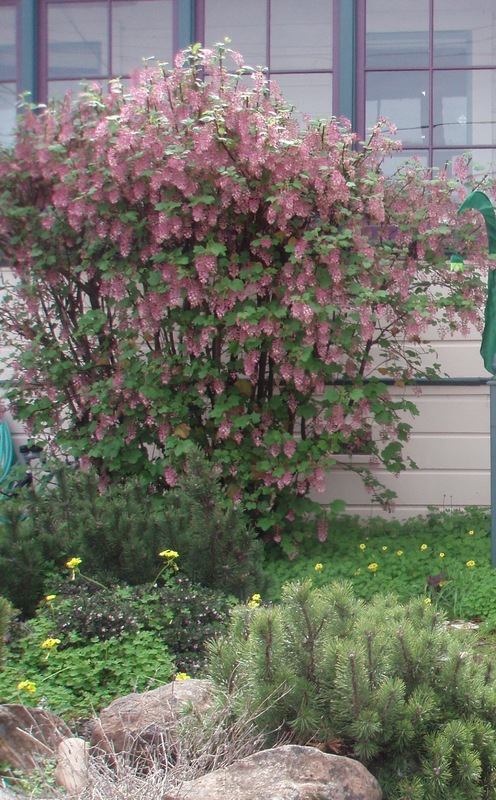 Add a couple of extra drip emitters or inline drip tubing to your irrigation system and they’re happy. 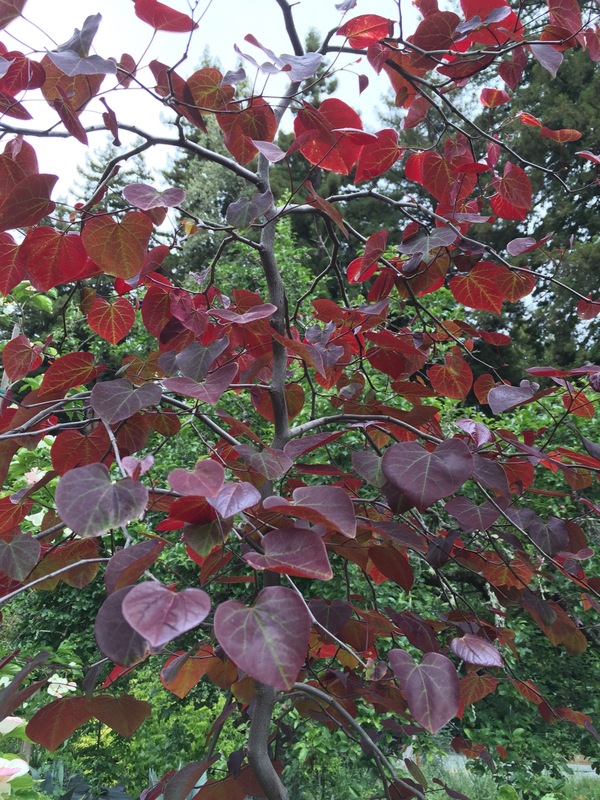 Besides enjoying the hundreds of blooming dogwoods, I learned about a redbud that is not as fussy as the lovely Forest Pansy. Ruby Falls and Merlot promise to be more reliable in the garden and more heat resistant. Jon will try his hand growing just about any plant that he thinks others will also enjoy. A fine crop of Alice oakleaf hydrangea grew near a block of Michelia ‘Inspiration’ getting ready to flower and scent the air. The lilacs had finished blooming but the peonies were just starting their show. 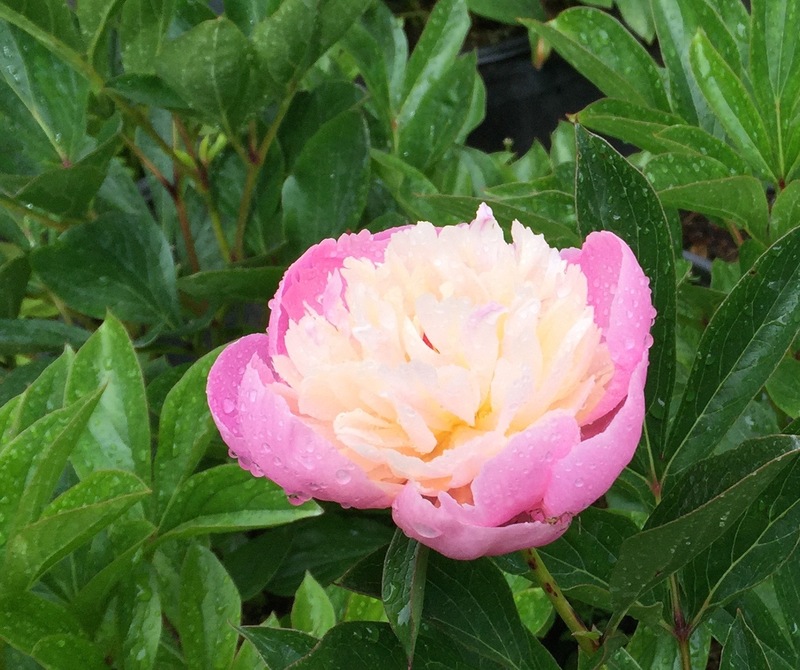 Jon shared a tip about tree peonies he learned recently from a well-seasoned Japanese gardener. He followed her advice and cut back the tree peony stem in the dormant season forcing it to produce new stems. Voila- they are now loaded with flowers. 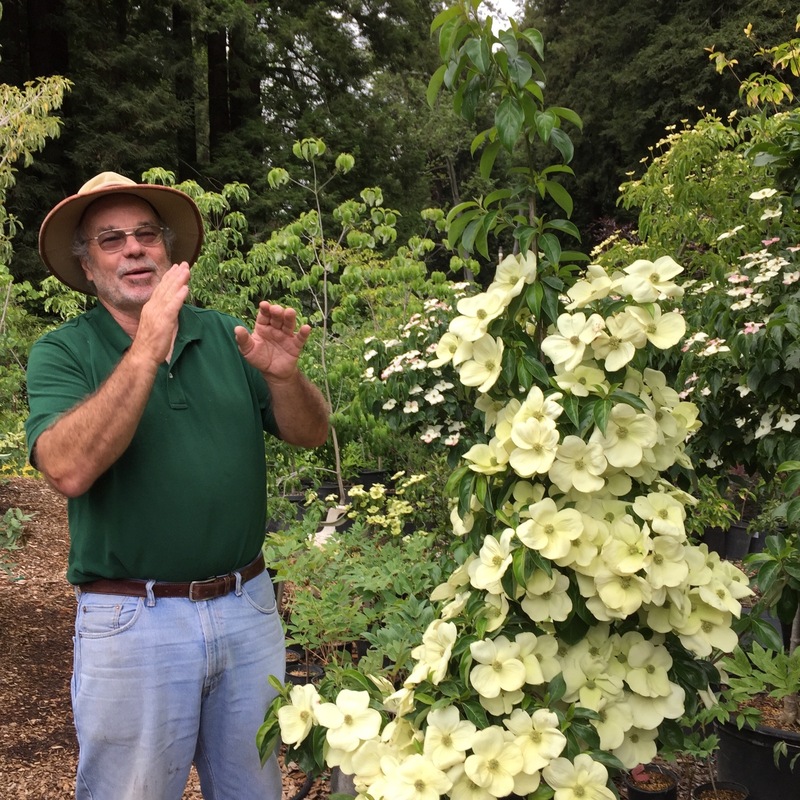 Jon grows many other types of dogwood and also Copper beech, magnolia macrophylla, Royal Raindrops crabapple , Sheri’s Cloud nyssa and even a Purple-leaved hazel. I could only fit a couple of 5 gallon cans in my car so a beautiful smoke bush in full bloom and a Black Lace elderberry now call Bonny Doon home. 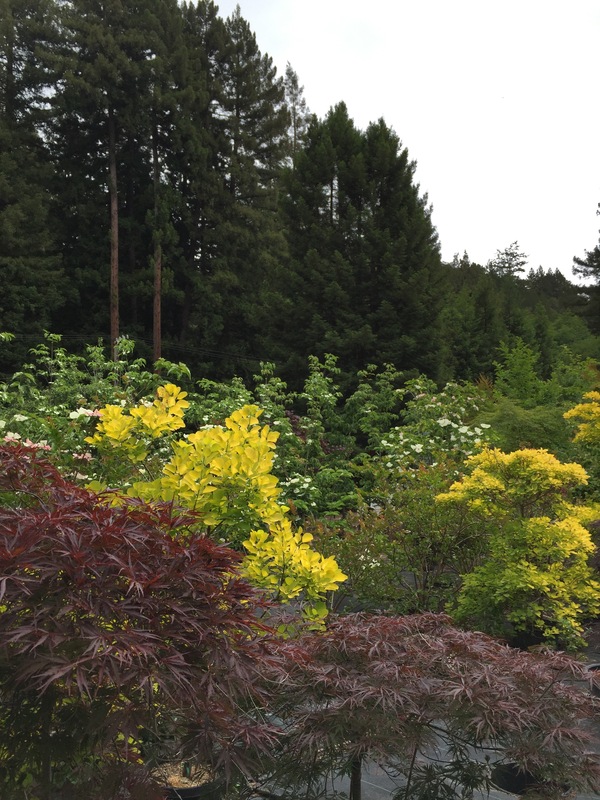 But I have my eye on one of those spectacular Mountain Moon evergreen dogwoods for the back garden.